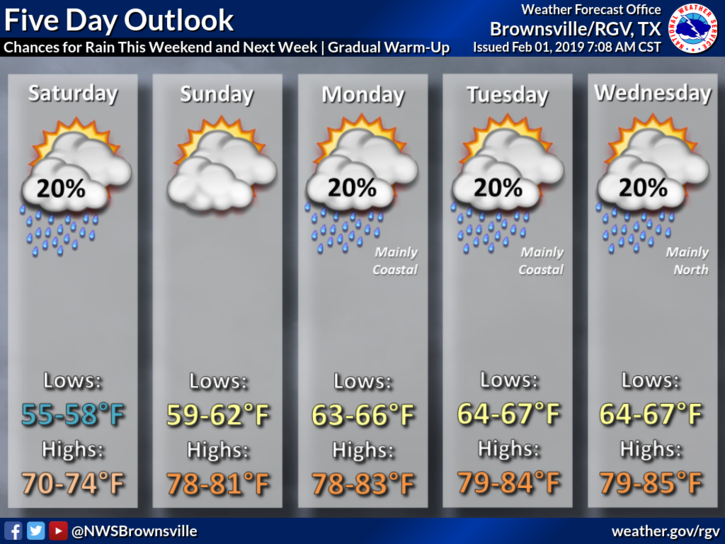 Highs are expected to be in the lower to mid 70s with partly cloudy skies across the Rio Grande Valley on Friday, according to the National Weather Service in Brownsville. McAllen will see a high of 73. The expected high in Brownsville will be 74. It will be cooler on South Padre Island, where the high is expected to be 69. Looking ahead, there is a 20 percent chance of rain on Saturday with lows in the upper to mid 50s and highs in the low to mid 70s. Sunday through Wednesday, the region could see temperatures in the 80s.